At the Guest Processing step of the wizard, select the Enable application-aware processing check box. In the displayed list, select a protection group or individual computer and click Edit. To define custom settings for a computer added as a part of a protection group, you must include the computer to the list as a standalone object. To do this, click Add and choose the computer whose settings you want to customize. Then select the computer in the list and define the necessary settings. On the General tab, in the Applications section, select Require successful processing or Try application processing, but ignore failures. 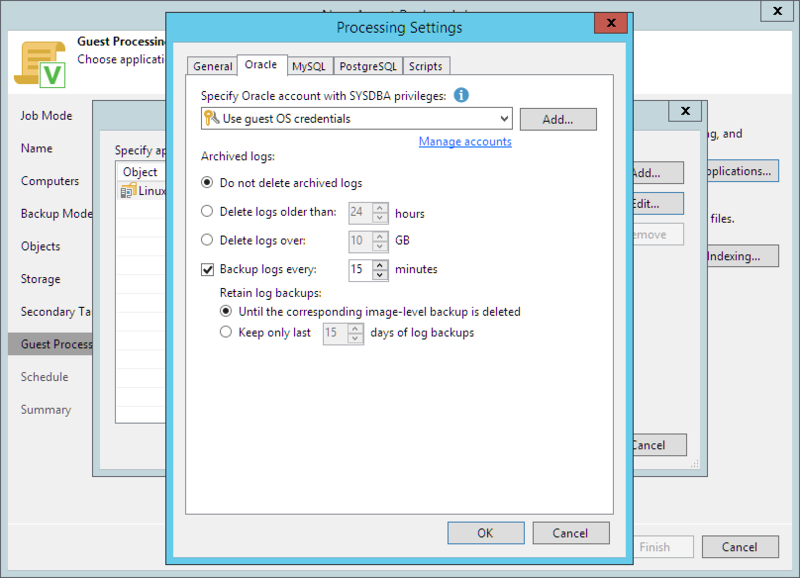 In the Processing Settings window, click the Oracle tab. To specify a user account that Veeam Agent for Linux will use to connect to the Oracle database, select from the Specify Oracle account with SYSDBA privileges list a user account that has SYSDBA rights on the database. If you have not set up credentials beforehand, click the Manage accounts link or click Add on the right to add credentials. By default, the Use guest credentials option is selected in the list. With this option selected, Veeam Agent for Linux will connect to the Oracle database under the account that you have specified for the protected computer in the protection group settings. Select Do not delete archived logs if you want Veeam Agent for Linux to preserve archived logs. When the backup job completes, Veeam Agent for Linux will not delete archived logs. It is recommended that you select this option for databases for which the ARCHIVELOG mode is turned off. If the ARCHIVELOG mode is turned on, archived logs may grow large and consume all disk space. In this case, the database administrator must take care of archived logs him-/herself. Select Delete logs older than <N> hours or Delete logs over <N> GB if you want Veeam Agent for Linux to delete archived logs that are older than <N> hours or larger than <N> GB. Veeam Agent for Linux will wait for the backup job to complete successfully and then trigger archived logs truncation via Oracle Call Interface (OCI). If the backup job fails, the logs will remain untouched until the next successful backup job session. [For Veeam Agent jobs managed by the backup server] To back up Oracle archived logs with Veeam Agent for Linux, select the Backup log every <N> minutes check box and specify the frequency for archived logs backup. By default, archived logs are backed up every 15 minutes. The minimum log backup interval is 5 minutes. The maximum log backup interval is 480 minutes. Select Until the corresponding image-level backup is deleted to apply the same retention policy for Veeam Agent backups and archived log backups. Select Keep only last <n> days to keep archived logs for a specific number of days. By default, archived logs are kept for 15 days. If you select this option, you must make sure that retention for archived logs is not greater than retention for the Veeam Agent backups. The maximum time period to keep archived logs is 60 days.